• Take more electives in the first year, and take them earlier in your program of study. • Travel through your curricular experience with a cohort of students with similar career interests. • Enter the workforce as a polished professional by taking two required breadth electives designed to prepare you with the skills employers desire. • Choose from 10 specializations organized in three tracks—finance, marketing, and consulting—as well as the opportunity to round out studies by choosing one or more minors, designed to provide a deeper understanding in six key areas. • Pursue various hand-on learning opportunities, such as international immersions, case competitions, and project-based courses designed for you to work with a team to develop real business solutions for clients. In addition, you can choose to pursue our STEM-designated MBA option, which shows recruiters that you’ll arrive on the job with analytic tools and leadership skills that positively impact a company’s bottom line. In addition, the designation allows international students to work in the US for up to 36 months on a student visa, if hired in a STEM-eligible role. Learn more about our MBA curriculum. 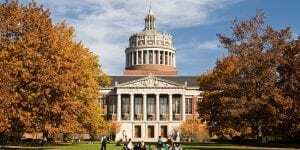 The University of Rochester Simon Business School full-time MBA Class of 2020 features 104 total students that are, on average, 28-years old. About 65 percent of the class is male, while 35 percent is female, and 40 percent of the class is international. Minority students make up about 31 percent of the class. On average, students enroll in the full-time program with 5.5 years of work experience a median GPA (80th percentile) between 3.2-3.8, and a GMAT score (80th percentile) between 610-710. Tuition for the full-time MBA at the Simon Business School is currently $46,000. About 80 percent of the full-time class receives scholarship support.